Got a group, want to travel? Broach Sports Tours will take care of all the arrangements when customizing your own sports tour package whether it is an NFL, MLB, Golf, Tennis, NASCAR or any sporting event. "Few things produce as much excitement, passion and dedication as sports". We want to help make your sporting event an experience you won’t forget. "Sports move us." "Sports change our behavior." So it’s no wonder that many successful businesses use sports incentive travel to draw in customers, reward key business partners and use as a sales incentive to inspire sales people to achieve better results for their company. A sales incentive that creates lifelong memories is one that inspires salespeople to reach new heights in performance. Sports incentive travel experiences, in particular, have the power to motivate by bringing together our love of sports, our desire to travel and the thrill of being at a live event. We provide incentive for group leaders depending on the size of your group. For further information about our sports travel packages, our incentive program, customized tour package or any other inquiry simply e-mail or call us. 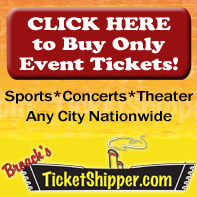 Be sure to sign up for Broach Sports Tours News for the latest sports travel information.